Why it's important to communicate risk to clients. Why should clients move money out of the market if it’s doing poorly — or even if it’s doing well? It’s important to educate your clients on what could happen so they understand the risk in our current market environment. Here are five reasons why clients should consider moving their money now, no matter how the market is performing. So what might be coming next in the market? The truth is, we just don’t know. What we do know is that the market moves in boom/bust cycles yet rises over time from one cycle to the next. With all the ups and downs of market cycles, it’s easy for clients to lose sight of where they might be in any current market cycle. Let’s take a look at the current cycle we’re in to gain some insight. Where are we in the current market cycle? We can think about it like the image below. To the left is the beginning of a market cycle, the middle is the height of gains and investment in the cycle, and to the right is the end of the cycle, usually where investors despair. If the image above represented our current market cycle, where on this bell curve do you, or your clients, think we are in terms of this market cycle? This is a great exercise to take your clients through. Ask them to show you where on this curve they think we are right now. Almost everyone would say that we are toward the top or at the top of this curve (demonstrated in the image below). Nobody would say that the market will keep going up forever. If we think we are at the top (or near the top), what is the next big thing in the market? Most advisors and clients would agree that it will be a market correction. I guess you would say it’s the one thing we know for sure will happen next. 2. When is the next bear market coming? What don’t we know about the next bear market? We don’t know when it will hit. Russell Napier, in his book Anatomy of the Bear, researched the bottom of the four largest bear markets in history. He asked whether there are any historical commonalities that run through the bottom of the biggest bear markets. He came up with some answers and has been pretty dead-on since the publishing of the book in 2005. We don’t want to create fear for our clients but rather make sense of what is going on. According to Bloomberg, since World War II, there have been 15 bear markets in the Standard and Poor’s 500. On average, these bear markets lasted almost one year and stocks fell almost 30 percent. It also can take some time to break even in stocks after a bear market. The longest break-even period in this time frame was after the 2000-02 bear market, when it took five years and eight months for an investor to recover from the previous peak. After the recession of 2007-08, it took four years and five months to make your money back. One of the few guarantees in the stock market is that things are bound to go wrong in the future. But this also makes it very difficult to predict when the next bear will strike. All of the data in the world on valuations, fundamentals, technicals, geopolitical events and sentiment can’t help you predict the precise moment other investors collectively will decide it’s time to panic. 3. How deep will the correction be? What else don’t we know? We don’t know how deep the correction will be. By definition, a market correction is 20 percent, but it could be more — much more. Could it be 30 percent, 40 percent or even 50 percent? We don’t know. History shows that market corrections could go deep. Napier believes it will be at least 50 percent from its height. It is true that investors buy stocks at all times throughout a given year. It’s also true that those buy stocks at all times throughout a given year would be selling their stocks at all times throughout the following year or later. In theory, there shouldn’t be any clumping — that is to say, a critical mass of sellers that would overwhelm buyers for a short duration and make stocks fall precipitously. But theory and reality often clash. 4. How long will the correction last? We don’t know how long the correction will last. By definition, it will have to be at least six months, but again, many corrections last for longer than that. The average of the four longest bear markets in American history is 17 years. The truth is, we just don’t know how long a correction will last. The longest bear market was 1929 to 1954. The problem that many investors face is that they want to know both prices and timing. That combination is almost impossible to forecast. It’s possible to forecast a price, potentially (although much harder) possible to predict a time interval, but certainly not possible to forecast both. Markets always should be viewed against ongoing trends. The U.S. stock market is in an uptrend right now. The way other markets are trending, combined with chart structures on the U.S. stock chart, can provide some price projections. For instance, a very long-term target of 2,500 points in the S&P 500 is certainly a realistic scenario. Forecasting exactly when that price level will be reached is impossible. So again, we don’t know how deep these corrections could go or how long they could last. If you could stand on the Dow the day President Ronald Reagan took office and look back, you would see a relatively mellow Dow line. You would see some small bumps, but the movements were not that pronounced. Now let’s look at the Dow from when President Barack Obama took office in 2009. You now look back from 2009, and you see a giant cliff looking down. The volatility has changed completely. It’s obvious that there’s been a paradigm shift in the markets. Since 1990, there have been major volatility shifts in the markets. No one knows the reasons why — whether it’s due to the advanced technology, or 401(k) plans changing the way the average investor saves for retirement, or maybe the cultural shift toward the acceptance of gambling as a society, who knows? What we do know is the volatility we’ve experienced in the past 30 years is vastly different from that of the previous 60-100 years. And what about now? Every day since President Donald Trump took office seems to bring a new political shock, so you might be surprised to learn that the stock market is just shy of all-time highs. The new president may be unpredictable, but that volatility has yet to spill over into the financial markets. But remember, there’s a high probability that investors will see a bear market during any president’s time in office. Bear markets are a natural outcome of a complex system such as the stock market, which is driven by emotions that can often take things to the extremes. It begs a number of questions: What will happen next? Will it be a little drop or a big drop? What is the trend? If you look at the graph above, it’s easy to see the trend is toward massive market movements. We don’t know when, how deep or how long the correction will be, but those truly are not the right questions to ask. The right question to ask is whether you have a plan to manage this type of risk for your clients’ retirement years. This is the one thing you have control over. You can’t control when, how deep and how long the next market correction will be, but you can control or help control your clients’ plans to deal with this risk. While it’s true that people need to think about where we are in the market so they understand the risk in the market and the risk we face right now, what they really need is a plan. Do You Have A Plan For Your Clients? You need a simple plan that clients can latch onto, a plan that will successfully lead clients to better financial decisions. If you give clients something simple that helps them understand how their retirement assets can be protected, you will retain their business. If clients can answer this question effectively, they will significantly increase their protection: Where do bond alternatives (such as fixed indexed annuities) fit into your portfolio of assets? 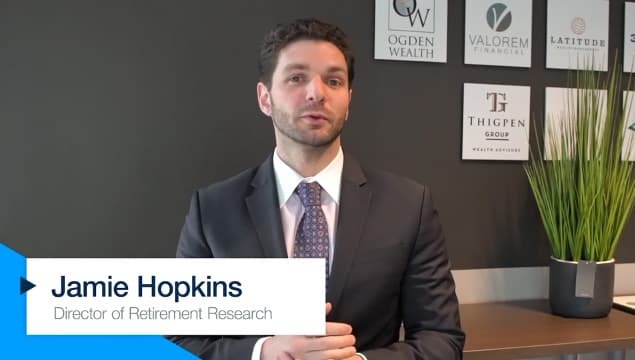 No matter what process you use, be sure that you have a plan in place to manage these types of risks for your clients in retirement or approaching retirement. In the long run, both you and your clients will be glad you did. Dave Vick is a principal with Simplicity Financial Marketing. Dave may be contacted at dave.vick@innfeedback.com. .